Feeling down? HONEY BADGER DON’T CARE! If you’re in the UK, don’t forget to grab tix for MC Lack-ee’s macabre cabaret – it’s Lovecraft: Reanimated! OR, if you’re out on the town in NY, check out Things at the Doorstep (featuring music from this podcast). And here’s a first look at the cover of Ian Culbard’s upcoming adaptation of The Case of Charles Dexter Ward. Good to see/hear you back again, guys! Had to wait until the end, but “Someone has to do the dishes” was worth it. Sorry, for your loss and as always I’m thankful for the show. Rereading this inert behemoth, I remain surprised at how much could have been omitted without doing injustice to the story. Maybe HPL was being paid by the word. It reminds me of the infamous technobabble chapter of the very first Buck Rogers story, Nowlan’s “Armageddon 2419 AD”, which interrupts a pitched battle to spend several pages explaining the workings of repulsor rays. At the outset the reader was warned that if you didn’t care about such things, you should simply skip to the next chapter — a courtesy Lovecraft failed to extend. And, yah, you’re not gonna like MEDUSA’s COIL any better. Though that would be a great name for a band, except, you know, that Lacuna Coil is a bit too close. Glad to have you back so soon. I hope you two are allright. Also: great narrator for this story. 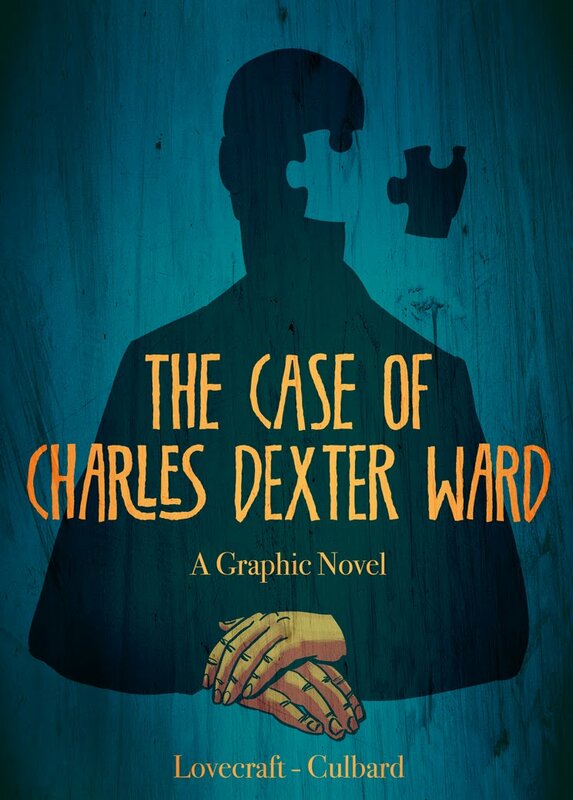 I like the cover for the Charles Dexter Ward graphic novel but … wait! Isn’t that the crazed hand model from the ‘Electric Executioner’?! Seriously can’t wait for Charles Dexter Ward, At the Mountains of Madness was really good. Glad to see you guys are back! “Someone has to do the dishes,” indeed! ROFL. Now that you are back my stars are aligned again. I hate it when they’re unaligned! Makes my underwear ride up. The idea of “editing” these tales so as to have less prose by H. P. Lovecraft is blasphemous. Happily, no professional editor would consider doing such an absurd thing. Having just reread “The Mound,” I find all of it superbly written and fascinating. Lovecraft wrote the story for a client, and she must have freaked when the final MS was sent her! Frank Long attempted to abridge the thing when trying to sell it to Weird Tales. The annotated text will soon be published in the two-volume set of THE CRAWLING CHAOS AND OTHERS, edited by S. T. for Arcane Wisdom Press. The jacket illustration is fabulous! I agree with Wilum (Hello, Wilum!) Editing HPL’s stuff is just a bad idea. Didn’t Derleth screw some stuff up that way? I agree with Iranon. Once you start cutting, there’s no way to know when to stop. Derleth did enough damage. No, I’m not for editing the stories, even though THE MOUND could sure use it. They are Lovecraft’s legacy, and as such should be retained inviolate… even things like THE STREET, which makes this Bishop revision look like Pulitzer material in comparison. I agree editing what already is when the creator is no longer around is a BAD idea… and some might question that if Lovecraft were alive if it would be prudent for him today to do such editing. Still, the responses to my tongue-in-cheek remarks notes a very good reason why I dislike abridged and condensed works; besides the ethics of it all, the practical question of where to begin and stop are daunting. Some stories like “The Shunned House” could certainly use some editing down of details to condense information that is not really needed to convey the same message. Perhaps where my comment originated and should have been focused is that, as discussed on the podcast, it would have been nice of Lovecraft had given some thought to brevity in some aspect of certain tales. William Gibson wrote something similar to The Mound, a short story called The Hinterlands. Unlike The Mound, he makes it work by doing just as Fifer and Lackey had suggested – left the entities vague and scary. RE: March 15 – Anniversary of Lovecraft’s death. Rest in Peace, Howard. And if they’re doing fleshcrafting, they’re probably Tzimisce. Your youtube link is dead.